Wall tap used in homes as a extra source for water supply. Mounted on fence or outside building walls. Made of single lever control for ease of use and comes with a locable end where you can add padlock to control water usage at home. 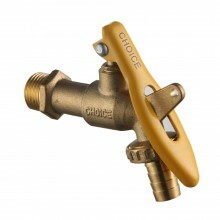 Click the button below to add the Choice Wall Tap 2 (Lockable) to your wish list.